July 11th: We’ve uploaded a number of presentations from yesterday’s seminar Ireland needs a pay rise: Wage floors and economic recovery, held yesterday (July 10th) in the Matt Merrigan Hall. The programme is available for download here. Click here to download the presentation by Prof Terrence McDonough of NUIG on Why the economy needs a pay rise. Click here to download the presentation by Sr Bernadette McMahon of the Vincentian Partnership for Social Justice on Minimum essential standards of living: Expenditure and a Living Wage. 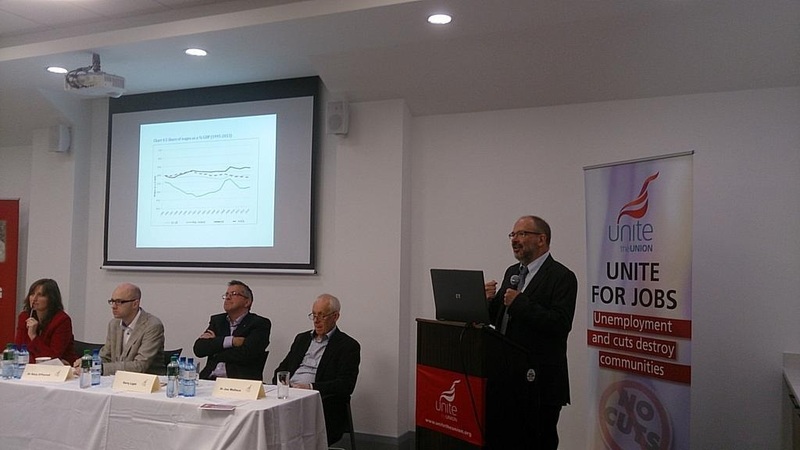 Click here to read the presentation by Dr Rory O’Farrell of the Nevin Economic Research Institute on Raising the floor: Driving up the Minimum Wage. Click here to read the presentation by Gerry Light, Assistant General Secretary of Mandate Trade Union, on Raising the floor: Increasing hours. Click here to read the presentation by Dr Joe Wallace of the University of Limerick on The contribution of JLCs to a pay rise. Click here to read the presentation by Unite researcher Michael Taft on Strategies for raising the floor. This entry was posted in Living Wage, Republic of Ireland news, Uncategorized and tagged Living Wage, Unite ROI, wages. Bookmark the permalink.